Today in Masonic History John Franklin "Home Run" Baker is born 1886. John Franklin "Home Run" Baker was an American baseball player. Baker was born on March 13th, 1886 in Trappe, Maryland. His family was 6th generation farmers and despite his baseball career, Baker was no exception. Growing up his brother Norman also showed some skill for baseball and had a try out with the Philadelphia Athletics. Norman did not like the city of Philadelphia and left the game of baseball long before Baker joined the ranks of professional baseball. Through high school Baker pitched for the high school team worked as a clerk in a family owned butcher shop and grocery store. In 1905, Baker signed with a semi-pro team in Ridgely Maryland. He was paid $5 a week plus boarding costs. It was quickly determined that Baker had no talent for pitching, was no good in the outfield, but could hit the ball. The manager moved him to third base and he played that position the rest of his career. In 1906 he began playing for Sparrows Point Club in Baltimore with a sizable increase in salary to $15 per week. In 1907 he was offered a contract with a Texas team which he turned down to remain in Maryland playing for a team in Cambridge, Maryland. In late 1907, Baker was given a tryout with the Baltimore Orioles, this was a class A league team with a longer schedule than the leagues Baker had been playing. He only played five games and had a dismal batting record. It was determined that Baker "could not hit" and was released. In 1908, Baker briefly played for a minor league team before his contract was picked up by the Philadelphia Athletics, the same team that his brother Norman had refused to play for because he didn't like the city. Baker closed the season with a .290 batting average with 31 at bats. The manager of the Athletics named him the starting third baseman for the 1909 season. It was also in the 1909 season that the Athletics had their "$100,000 infield." This was due to the high price of the combined salaries of Baker, the 1st baseman, 2nd baseman and shortstop. In the late 1909 season, the Athletics were playing the Detroit Tigers when Ty Cobb sliding into third spiked Baker, hit Baker with the metal spikes on the bottom of his shoes, and cut his arm. Baker and the Athletics manager claimed that it was intentional. A picture taken for the Detroit News proved that it was an accident, the Detroit Press went after Baker making out to be "thin skinned" and easily rattled. This opinion would follow him for some time in his career. In 1910, Baker and the Athletics won the World Series against the Chicago Cubs. In 1911 they met the New York Giants in the World Series and due to Baker's previous run in with Cobb, the New York players believed that they could intimidate Baker. In game one Baker was intentionally spiked twice by the same Giants player. The first time knocking the ball loose, but not the second time. Baker let his bat do the talking during the series .375 batting average. During the series heavy rains caused massive delays between the games giving Philadelphia sports writers the time to magnify Baker's feats on the field. It was at this time that Baker got the nickname "Home Run." It should be noted that Baker played in what is called the dead-ball era of baseball. The baseball was constructed differently and the game itself was played more strategically. In modern terms the game was more "small ball" there were no big hitting displays, home runs were less common due to the size of the field and the nature of the ball. As an example in 1909 Baker only hit 4 home runs, one of them being the first to ever be hit out of the park out of the right field fence. He was fourth in the league on his slugging percentage at .447 (total number of bases divided by at bats). He was first in the league in triples with 19. It was not until 1919 as Babe Ruth, Baker's future teammate, came on to the scene that the ball was changed and more home runs started to be hit. By 1914, the $100,000 infield had lost it's luster and the manager had begun selling off players. Baker had just signed a three year deal and wanted to renegotiate, because of this he ended up sitting out the 1915 season. 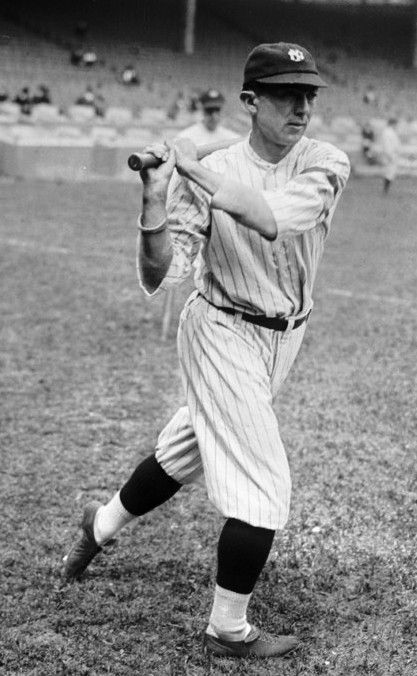 In 1916 he began playing for the New York Yankees. In 1918, just before Babe Ruth came on the scene, a New York sports writer coined the phrase "Murderer's Row" to describe Baker and 5 of his team mates and their hitting skills. The more common use of the term didn't come until well after Baker was off the team. The newer "Murder's Row included Babe Ruth. Baker retired as a player after the 1922 season when the Yankees lost to the Giants in the World Series. Baker briefly was a manager in the 1924 and 1925 seasons in the minor leagues. Baker, unlike some of his fellow players particularly Babe Ruth, did not drink, smoke or swear. After every season he returned to his farm in Trappe, Maryland. At home he was also a member of the Trappe Town Board, a tax collector and volunteer firefighter. Baker passed away from a stroke on June 28th, 1963. Baker was a member of Coats Lodge No. 102 in Easton, Maryland.